Most times, these WhatsApp messages we send just every time from our iPhone start cluttering up the device and become uncomfortable to users. Besides, it is important to state that having these kinds of messages undeleted gives way to privacy related issues especially when these messages are obtained by data criminals. In addition to that, these WhatsApp histories gradually start eating up your storage spaces which causes some disadvantages to iPhone. One of the drawbacks is that your device starts performing sluggishly as a result of lack of storage space. However, there is a solution to delete WhatsApp history and that is what this article is all about, continue reading. Part 3: How to Delete WhatsApp Backups from iPhone? 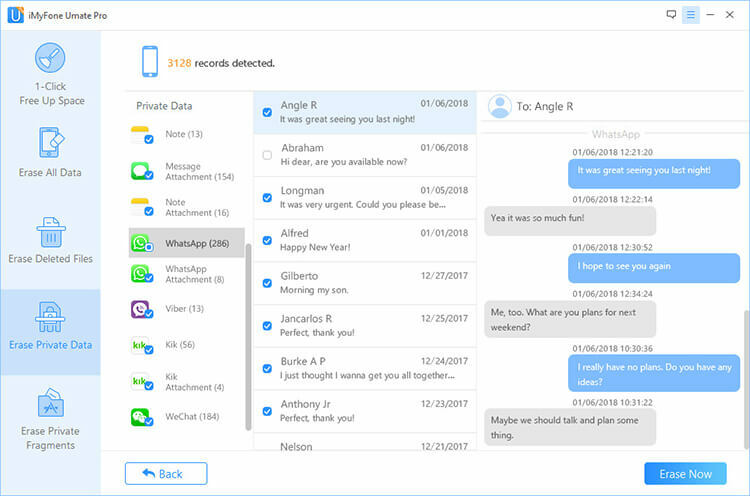 Like said earlier, it becomes necessary at some point to delete messages and chats on iPhone if you really want to ensure that your privacy is not breached and also to clear or save some storage space which is important to your iPhone. Launch WhatsApp on your iPhone and tap "Chats" section. Find the chat you want to delete and scroll it to the left. Tap "More" option and select "Delete Chat" then. Confirm it by tapping "Delete Chat". 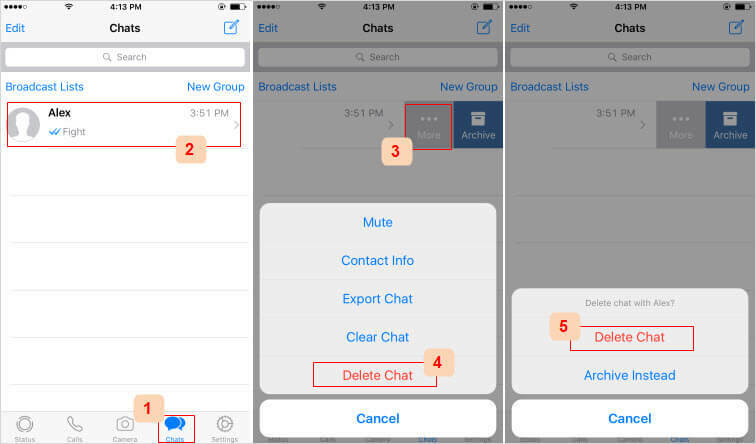 The following are the steps to delete WhatsApp chat history from iPhone. Choose "Settings" from the bottom menu. Find and tap "Chats" option. Enter your phone number and click "Clear All Chats" to confirm. 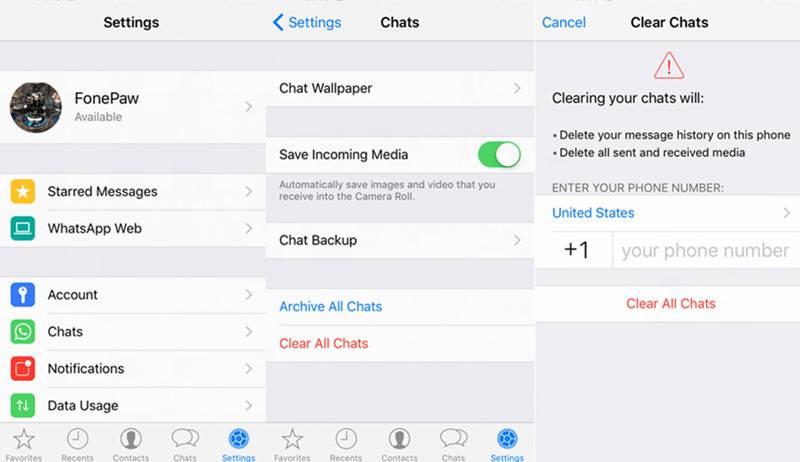 Please, note that the WhatsApp chats you manually delete from iPhone is not gone forever. That means, anyone can use recovery tool to scan and recover the files you deleted. If you want secure privacy, you need to permanently delete the data, which will delete the files also from your iPhone device drive. So how can you permanently delete WhatsApp history? iPhone doesn't have such option but you can take advantage of iMyFone WhatsApp Data Eraser. It's specifically developed to destroy all your unwanted data from iPhone and make them 100% unrecoverable. It applies the advanced technologies to repeatedly overwrite your data, that's why erase data is no long recoverable. Erase Current WhatsApp History: Completely erase WhatsApp messages, photos and videos from iPhone without leaving any traces to recover. Previews are available first. Wipe Deleted WhatsApp Messages: Previously deleted WhatsApp history which are still recoverable will be scanned and fully wiped from iPhone device drive. All iOS data are supported, including messages, photos, videos, notes, browsing history, contacts, call history, etc. Detailed Steps to Completely Erase WhatsApp History? Step 1: Run the program on your PC and connect your iPhone to it. Step 2: Select the Erase mode that best suites the task and let it scan. 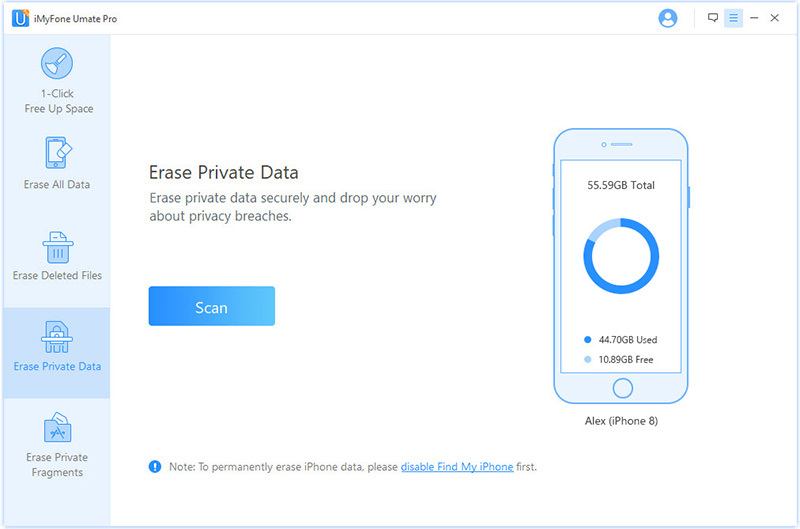 Erase Private Data: It will scan and erase the current data on iPhone. Erase Deleted Files: It mainly scans the previously deleted files from iPhone storage and drive. Erase Private Fragments: It will scan the leftover traces or fragments left by third-party apps. Step 3: Preview and select the WhatsApp messages or attachments you want to get rid of. Click "Erase Now" button to continue. Step 4: Confirm the erasure by typing "delete" into the box and clicking "Erase Now" button again. Why Should We Make Private iPhone Data Unrecoverable? The reality of today’s world is that there are so many criminals who would take advantage of your data to commit crimes or harm your interests. This means that when you sell, donate or exchange your iPhone, there will always be a risk of having your data fall into the wrong hands if they are recoverable. However, making your data unrecoverable gives you the assurance that nobody can have access to your data no matter how hard they try to. Therefore when you delete your data, you are rest assured that it can never be recovered again and this is what the Umate Pro tends to achieve. The reality when is using WhatsApp is that it can store a whole lot of text, videos and images on your device which could eat up large chunk of space on your device in addition to privacy concerns. It is important to delete these backups. Your WhatsApp Chat History Backup files are saved in the /sdcard/WhatsApp/Databases/ folder. - You cannot open these folders outside of WhatsApp. - Make sure you have a file manager to be able to delete these files. It is important to note that there are several ways of deleting these messages but not all of them give the same result. For example, the solutions stated above will delete these WhatsApp messages but it is not permanent. The implication is that these WhatsApp messages can be recovered with recovery tools and this is not good for your data security. However, you have a complete solution that can delete your WhatsApp messages permanently in such a way that it can never be recovered by the best recovery tools.